Initial Preventive Physical Examination and Other New Medicare Benefits—The Medicare Prescription Drug, Improvement, and Modernization Act (MMA) of 2003 establishes coverage of a one-time “Welcome to Medicare Physical Examination” within 6 months of a beneficiary’s first coverage under Part B, with the goal of health promotion and disease detection. The benefit covers a physical exam (including measurement of height, weight and blood pressure, and an electrocardiogram) and includes education, counseling and referral with respect to screening and other preventive services. The effective date is January 1, 2005, for new beneficiaries whose coverage period under Medicare Part B begins on or after that date. The MMA also adds coverage for cardiovascular and diabetes screening for Medicare beneficiaries, which also begins on January 1, 2005. Weight Control Information Network (WIN)— This network is a national information service of the National Institute of Diabetes and Digestive and Kidney Diseases. WIN develops and distributes science-based materials on obesity, weight control, physical activity, and nutrition for patients, health care professionals, and others in English and Spanish. WIN also created the Sisters Together: Move More, Eat Better media program that encourages Black women 18 and over to maintain a health weight by becoming more physically active and eating healthier foods. More information on WIN is available at http://win.niddk.nih.gov/index.htm. National Diabetes Information Clearinghouse (NDIC)—The NDIC is an information dissemination service of the National Institute of Diabetes and Digestive Kidney Diseases. The NDIC was established to increase knowledge and understanding about diabetes among patients, health care professionals, and the general public through the effective dissemination of information. Patients and health care providers can contact the NDIC with inquiries about diabetes and order educational material. More information is available at http://diabetes.niddk.nih.gov. 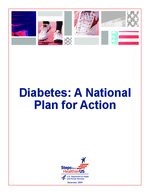 National Agenda for Public Health Action: A National Public Health Initiative on Diabetes and Women’s Health—This initiative offers recommendations to help health professionals, women and their families, health care systems, worksites, communities, and schools address the burden of diabetes among women. The Centers for Disease Control and Prevention is working with public- and private-sector partners to implement the plan. More information is available at http://www.cdc.gov/diabetes/pubs/action/index.htm. Take Time to Care About Diabetes—This campaign developed by the Food and Drug Administration Office of Women’s Health is intended to raise women’s awareness of the seriousness of diabetes and the importance of taking steps to treat the disease to avoid heart and kidney problems, blindness, stroke, or amputation of a lower limb. More information is available at http://www.fda.gov/womens/taketimetocare/diabetes/default.htm. Diabetes Today—Developed by the Centers for Disease Control and Prevention’s (CDC) Division of Diabetes Translation, Diabetes Today is a course that provides training for public health professionals and community leaders to learn how to mobilize communities to address diabetes. This curriculum is based on the philosophy that people can take charge of diabetes at the community level. Rather than relying on expensive medical treatment after the complications of diabetes have developed, community members—such as people with diabetes and their families, health professionals, and other concerned individuals—can work together to prevent and control diabetes. For more information, call toll-free 1-877-CDC-DIAB, e-mail diabetes@cdc.gov, or visit the Diabetes Today National Training Center and the Pacific Diabetes Today Resource Center. More information is available at http://www.diabetestodayntc.org/. Making Systems Change for Better Diabetes Care—As part of National Diabetes Education Program, this comprehensive Web site provides information and tools to make effective systems changes and provide better quality care for the diagnosis, treatment, and prevention of diabetes. More information is available at http://betterdiabetescare.nih.gov/. Nutrition and Physical Activity to Prevent Obesity and Other Chronic Diseases program—The Centers for Disease Control and Prevention’s Division of Nutrition and Physical Activity developed this program in response to the growing epidemic of overweight and obesity in the United States. This is a comprehensive program designed to help states maximize the effectiveness of their efforts to prevent obesity by addressing two related risk factors: nutrition and physical activity. The goal of the program is to make the United States a nation where all people can achieve and maintain a healthy body weight. Through a cooperative agreement process, this initiative provides funds to states for up to five years for programs aimed at reducing the rate of obesity among their citizens. More information is available at http://www.cdc.gov/nccdphp/dnpa/obesity/state_programs/index.htm. National Diabetes Prevention Center (NDPC)—This Centers for Disease Control and Prevention funded national center, is working to identify, design, adapt, and share effective programs for diabetes prevention and control in American Indian and Alaskan Native communities. The NDPC supports initiatives in tribal education systems, information technology, diabetes self-management education, sharing diabetes prevention efforts across American Indian and Alaska Native communities, and translating promising practices that are both culturally relevant and science-based. More information is available at http://www.cdc.gov/diabetes/projects/ndpc.htm. You Can! Campaign—Developed by the Administration on Aging, the You Can!—Steps to a Healthier Aging campaign is a part of the Steps to a HealthierUS initiative. The You Can! campaign is designed to increase the number of older adults who are active and healthy through a partnership approach to mobilizing communities. These community partnerships will increase public awareness and provide appropriate programs to help older Americans improve their nutrition and physical activity. Health Disparities Collaborative –Diabetes Prevention—The Health Resources and Services Administration, Bureau of Primary Health Care in collaboration with the Centers for Disease Control and Prevention, National Institutes of Health, and other partners, including the Institute for Healthcare Improvement are working to prevent diabetes among high risk individuals served by Federally Funded Health Centers. A Health Disparities Collaborative Diabetes Prevention pilot has been completed with excellent results in patient outcomes. The learning from the Diabetes Prevention collaborative will be integrated with the Cardiovascular Collaborative for improved primary health care in Federally Funded Health Centers. (See Current Activities—Treatment section for additional information on the Health Disparities Collaboratives). 81The Finnish Diabetes Prevention Study conducted by the National Public Health Institute–Helsinki yielded similar findings supporting the importance of maintaining a healthy weight to prevent type 2 diabetes. ; and Diabetes Prevention Program Research Group. (2002). Reduction in the incidence of type 2 diabetes with lifestyle intervention or Metformin. New Eng J Med 346(6):393-403.